Yogurt is a cornerstone of Indian meals, it’s served alongside the spicy curries to temper the heat. It can be served plain, which does the trick, or made into raita for something extra special. 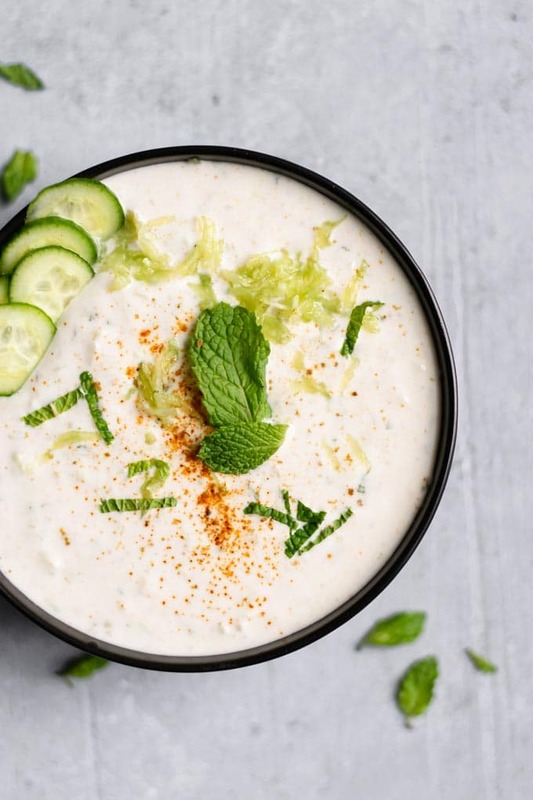 Raita is an Indian yogurt sauce, full of cucumber and mint plus a few spices. 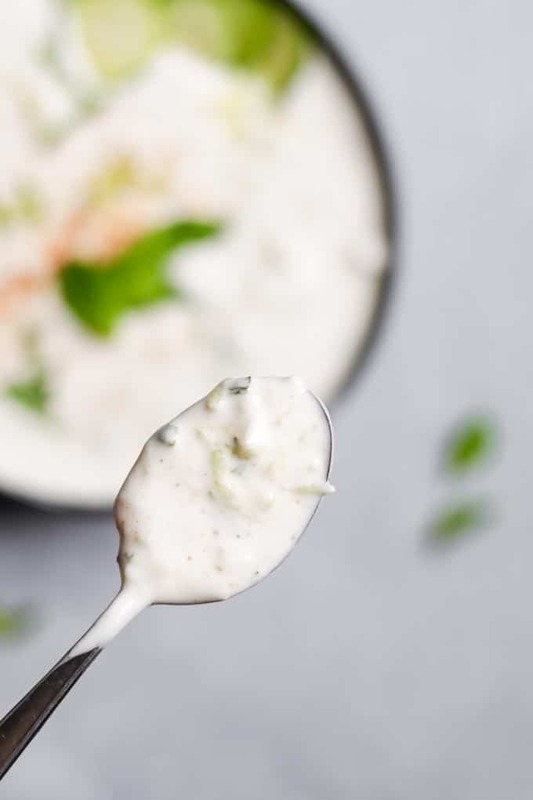 This vegan raita is as perfectly tangy, creamy, salty, spiced, and mouth-watering a sauce as the non-vegan original. It’s so simple to make and elevates any Indian, Pakistani, or Bangladeshi meal. 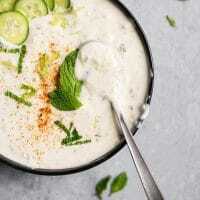 This cucumber raita was made following my mother-in-law’s recipe, as recounted by my husband Omar. Omar’s request for a vegan raita took me by surprise, as he never shows much interest in yogurt generally speaking. Apparently adding a few things to yogurt turns it irresistible! Each batch of raita disappears quickly, served alongside spicy curries, potato hash, stews and more. A bit more quickly than expected actually, with spoonfuls of the yogurt sauce being snuck between meals. When a recipe has few ingredients, those ingredients matter. Most importantly with raita is of course, the choice of yogurt. Indian yogurt is thick and tangy and made with full fat milk. It’s fresh tasting and more similar to Greek yogurt than American. When I was 11, my family lived in a small village in rural Gujarat for a few months, and as was common in the community made our own yogurt from regular doorstep deliveries of what was quite possibly unpasteurized cow’s milk. No yogurt could quite match the memories of that experience, and it took almost 2 decades for vegan yogurts to even get close, but hey, we’re there! There are a lot of brands of very delicious plant based yogurts. When choosing your vegan yogurt brand for making raita, first you’ll want to choose a plain and unsweetened (no added sugar!) yogurt. 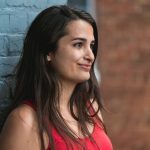 Whether it’s a soy yogurt, almond yogurt, coconut yogurt, cashew yogurt, etc–there are enough natural sugars to feed the culture and you don’t want any added sweetness. If multiple options are available to you, choose a yogurt you know to be on the tangier side and thicker. 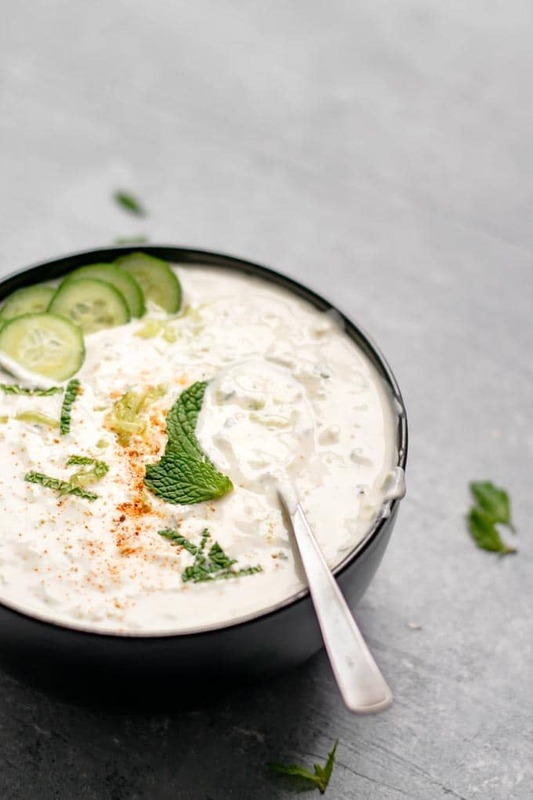 Thinner, more watery yogurts are not ideal for raita, but if that’s all you can find don’t worry about it, it will still taste great and there are some other ingredients in there that will help thicken it. Choose the plant based yogurt you like, but the best one is definitely the one you have access to! Homemade works wonderfully as well if you follow that route–just make it plain with no added sugar. Because I know it will come up, I used So Delicious Coconut Yogurt in this recipe (not sponsored). It’s one of the thicker vegan yogurts I have come across which is ideal for raita. I also think the mild coconut flavor complements Indian food really nicely. For my mother-in-law’s raita, you add sour cream to the yogurt. Sour cream is thick, tangy, and creamy. It’s rich and has a cooling effect similar to yogurt. Swapping dairy sour cream for vegan is simple. Next comes cucumbers. For this recipe, peel the cucumbers and then grate them before adding to the yogurt and sour cream. Grated, they almost melt into the sauce. Cucumbers make the raita almost juicy and provide additional cooling sensations. 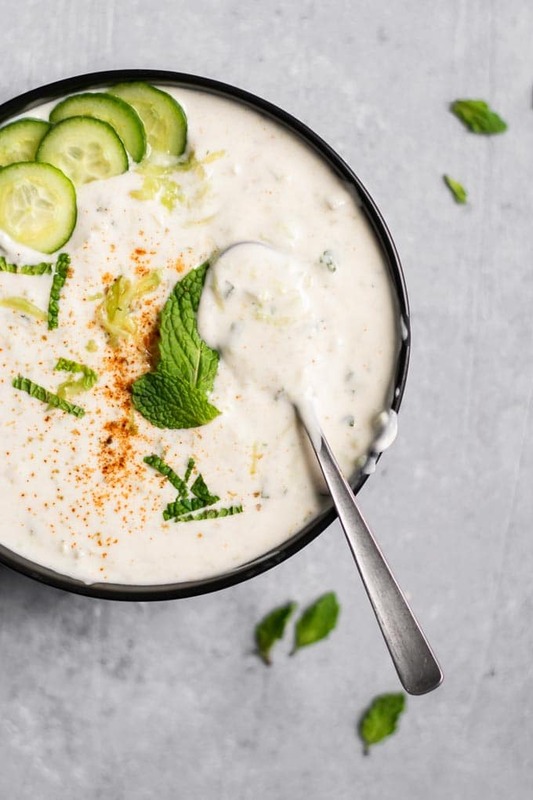 There’s a reason why cucumber raita is the most popular version. With the cucumbers, we add freshly minced white or yellow onion. I prefer to add just a little bit of onion, as I don’t like to overpower the dip with the taste of onion. A scattering of finely diced onion throughout the dip adds just the right amount of flavor and crisp textural contrast. Then we have the mint, it’s a perfect pairing with cucumber as it’s refreshing and cooling, while brightening up the flavors of the dip. Add enough mint to get a bursts of minty flavor, but not enough to make that the main flavor takeaway of the raita. Lastly add cumin, cayenne, and salt. The two spices and the salt amp up the savoriness of raita. To make the raita, all you have to do is combine all of these ingredients! Make it in advance and store it in the fridge, or enjoy it right away! Raita can be served alongside anything flavorful and spicy. This includes all of the Indian recipes on my site, as well as the Afghan and Tibetan recipes. This vegan raita is a perfect dip for homemade naan, would be delicious over my vegan curry burgers, served with chana masala, and is ideal with any dry sabzi (vegetable curry). Don’t limit yourself to Southern Asian cuisines when pairing raita. It’d be great with chili or black bean soup. We enjoyed ours with a West African inspired sweet potato peanut stew. And, like I mentioned earlier, this vegan raita was enjoyed by the spoonful! I highly recommend trying this recipe, you’ll never look at yogurt the same way! As in, you can’t look at it without getting all the cravings for raita 😜. If you make this vegan raita, leave a comment below and rate the recipe on the recipe card. And please share your photos with me on Instagram, tag @thecuriouschickpea and #thecuriouschickpea, I love seeing your creations! LIKE WHAT YOU SEE? FOLLOW ALONG ON INSTAGRAM, FACEBOOK, AND PINTEREST! Mix everything togeter in a mixing bowl, starting with 1/2 tsp of salt. Taste and adjust seasonings as desired. Eat immediately or make in advance, store in a sealed container in the fridge. Choose a tangy and thick plant based yogurt for best results.